Strong Aluminium Hockey Goals complete with puncture-proof wheels as standard. 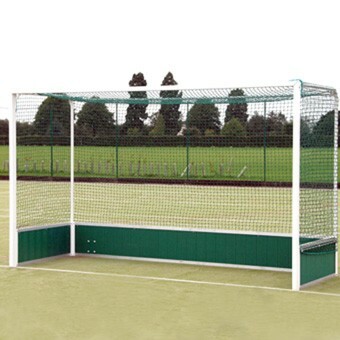 Top quality freestanding goals – uprights and crossbars are manufactured from 75mm x 50mm heavy gauge reinforced aluminium powder coated white. Regulation backboards are manufactured from 25mm thick tongued and grooved plastic boards, which are framed top and bottom with aluminium. They have 40mm diam international style net supports and a top back bar. Stainless steel lacing rods for net fixing are supplied all round and puncture proof wheels 260mm diam are fitted to the rear of each goal. When securely anchored these goals comply with British Standards.